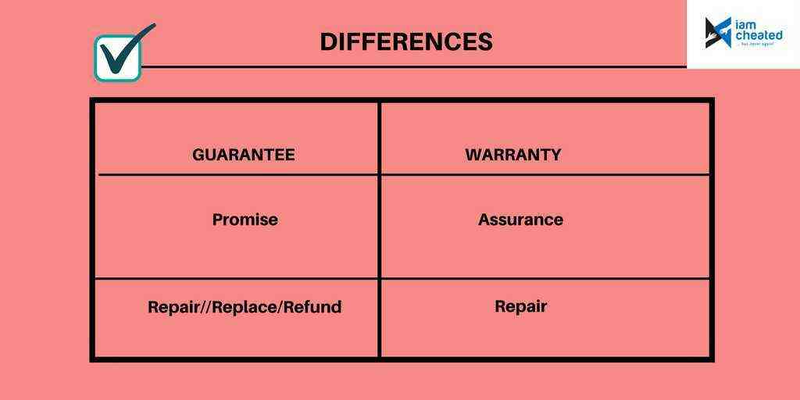 What's The Difference Between Guarantee and Warranty? You will come across two words, warranty and guarantee when you purchase new products. Guarantee and Warranty protect consumer rights, as they provide solutions in case the product purchased is faulty. When you purchase a product, the buyer will promise you many things. However, if the product is defective, you will lose all your money. This is where warranty and guarantee will help you. It will ensure that the product is fixed or replaced if there are problems. People are often confused between guarantee and warranty. As a customer, before buying a product in traditional/online mode, you should know the difference between guaranty and warranty, to avoid getting cheated. Guarantee is a commitment made by the manufacturer to the buyer. Just like a guarantor stands behind a loan, the manufacturer stands behind the product. If a product under guarantee is of low quality, it will be either repaired/replaced, or the money paid will be refunded to the buyer. Warranty is an assurance given by the manufacturers to buyers, that if the product breaks or if there is any problem with the product, the manufacturer will repair the product for free. But, the manufacturer will not replace the product. For instance: If your straightening machine stops working suddenly and is covered under a 6 months warranty and it has been only 2 months since the purchase, you can take it to the service centre and get it repaired for free. If your product is not covered under the warranty, then you will have to pay and get it repaired. The guarantee covers products and services, whereas warranty covers only products. In case of a guarantee, refund of the amount is possible, if stated. But, refund of the amount is not possible in case of warranty. Let’s say you have bought a tablet which is under warranty for 6 months. After 3 months if the tablet slips from your hand and the screen breaks, this is not covered under warranty. You need to pay and get the screen replaced. After the completion of the warranty period, you can extend it by paying an additional amount. But, in case of guarantee after the completion of the guarantee period, additional guarantee cover is quite rare. Guarantees can either be in oral or written form, but it is very hard to prove oral guarantees. Warranty will usually be in written form, so it can easily be proven. Refund of money paid is not possible in case of a Warranty. On the other hand, refunds can be given in guarantees or the product will be replaced.